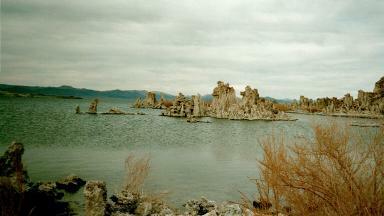 Tufas at Mono Lake, which was one of the weirdest places I have ever visited. Around the edge of the lake are the dimwitted brine flies and within the lake are millions of brine shrimp. Mono Lake is “about 2 1/2 times as salty and 80 times as alkaline as the ocean.” The tufas are “calcium-carbonate spires and knobs formed by interaction of freshwater springs and alkaline lake water.” Wild.